Issues with Bright MLS? Click here! 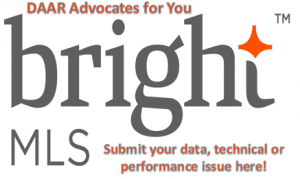 Welcome to DAAR’s Bright MLS page, your one-stop for submitting a technical or data related issue, accessing training resources and reviewing the latest updates on the system. To submit an technical or data related issue with the system, click on the image to the right and let us know! Progress on these issues are documented and communicated via Requested Changes and Known Issues site. Register NOW: Bright MLS Onsite Training Clinic on March 25! If you need any assistance, please contact the Customer Support Center at 1-844-55-BRIGHT (1-844-552-7444). If you would like to provide feedback on the Bright MLS to DAAR, please complete this form!